Joey and I were in a horrific car accident several years ago. A man fell asleep at the wheel of his car and pushed us over a guard rail when he hit us. Our van overturned three times, and although I was wearing a seat-belt, I was thrown from the vehicle. I suffered massive injuries, including a broken neck and crushed spine. I had 23 hemorrhages in my brain, and my family was told I would be a vegetable the rest of my life. During my 3 months in the hospital, I woke up one morning and knew who I was. Tests showed my brain was completely healed! I now know what a miracle truly is. 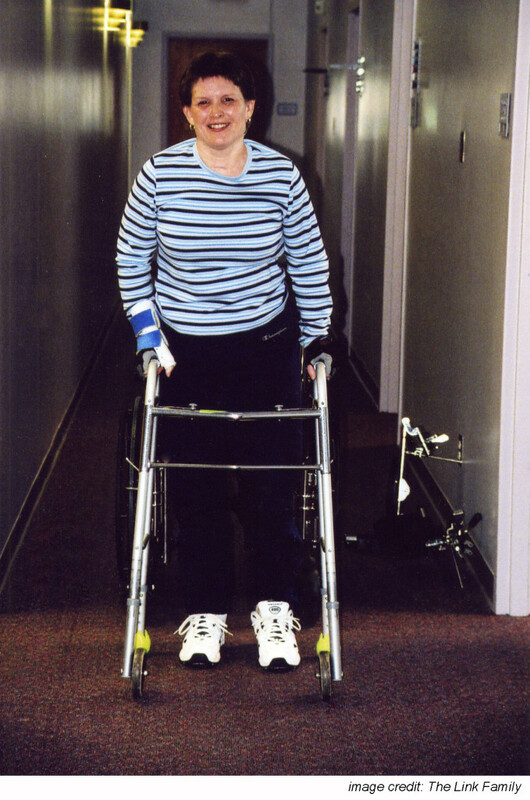 However, I must wear three braces to walk and use a walker, as I cannot stand without holding on to something. I sleep in the living room as there is not a place to put an elevator or lift in our home and I can’t go upstairs. I suffer constant pain from a nerve injury that will never heal on its own. God chose to heal my brain, but He did not choose to heal much of the brokenness in my body. I now understand when He says, “And we know that for those who love God, all things work together for good…” (Romans 8:28), God means for our eternal good, not our earthly good. Having limited mobility and devastating pain is for my eternal good and I accept that. When Christians ask my why God allowed this to happen to us, I tell them that He didn’t allow it, He planned it. We were on that specific highway while driving home from teaching at a family camp at that specific time because it was part of God’s plan for us. Then I ask them, “Why not us?” The Bible clearly states Christians will go through tests and suffering (James 1:2-4), and that when we do we are to count it as joy. Why do Christians think we should be immune to it? And why do Christians think God is cursing them when we are told to count it as joy? When people ask me how I can be so positive when I face the difficulties I live with every day, I ask them if I should lie in bed and moan and groan all day, or would it be better if I get up, put a smile on my face and do what God is asking of me that day? There is nothing in our lives we cannot do with excellence of character. In all things we are to reflect the glory of God, including sweeping the kitchen floor while sitting in a wheelchair. When people ask me if it is hard not to be able to do the things I could do before the accident, I tell them that I choose to focus on what I have and what I can do, not on what I no longer have and on what I can’t do. When people ask me if it bothers me I have gained weight since the accident, I tell them that I would be a whole lot more bothered if I stopped taking the medications that are causing the weight gain. When Christian ask me what un-confessed sin I have in my life which God is punishing me for, I let them know I am so relieved their lives are in a constant state of confessed sin or they should be afraid to get in their cars and drive home. I tell them God looks at the heart and my heart is not disabled. People do not understand what it is like to live life differently than most, and I remind myself of this all the time. They have needs and I have needs. Our needs look different, but they are still needs. People have pain and I have pain. Our pain feels different, but it is still pain. No matter what your pain is, the ONLY way to deal with it is to get on your knees and let God know you cannot live one minute of a day without Him. All God wants of us is to recognize our often desperate need of Him. To God be the Glory. My (Carla’s) grandparents had a chicken coop on their property in Arkansas. I loved to watch the chickens and collect eggs for my grandmother on our visits there. There was one rooster, and he was in control. How did I know this? After all, he wasn’t wearing a sign saying, “I’m the boss!” I noticed all the hens did whatever he wanted. They were at his beck and call. The hens were the nurturers of their chicks. There was no chaos in that coop. There are many who think kids can’t behave like little chicks do. In Ephesians 6:1, it says, “Children obey your parents in the Lord for this is right.” According to this verse, God expects children to obey. He doesn’t hope they will, want them to or keep His fingers crossed. He expects it, no ifs or buts about it. Not only does He expect children to obey, He goes on to say, just in case anyone thinks this is unfair, that this is right. How do children learn to obey? This verse says God gave every child parents to teach him/her what authority looks like. What does authority look like? 1. Authority is not equality. People in positions of authority are not your peers. This is why they have titles such as boss, policeman, teacher, coach, and parent. To be an effective parent means you are not your child’s equal, or friend. You are certainly friendly, but your kids are not on a peer level with you, and you need to stop treating them like they are. 3. Authority needs to be balanced. Balanced authority does not exasperate those under him. (Ephesians 6:2) This means parents do not ask their children to do something they can’t do. Your child can do his homework. Telling him to do it when he is too tired or stressed to think or has other commitments is exasperating him. If he doesn’t have time to do his schoolwork, work with him to prioritize his time and scale back on his other commitments. 4. Authority teaches. Teachers share what they know, they help their students understand the ‘why’ and ‘how’ of the topic at hand (age-appropriate). A toddler won’t understand why he has to say ‘please’ when he wants something because he doesn’t know what being polite means, but he can still be taught to say (or sign) it. An older child will comprehend why you need to be polite and saying ‘please’ is how you can be polite. 5. Authority trains. When you train you teach, but you also guide and direct those under you, using discipline when necessary. Discipline motivates a child to use the teaching you have given him wisely. 6. Authority loves. Loving authority is not demanding or legalistic. While it will require disciplining those under them, this authority is respected and loved in return. The chickens trust their rooster when he is a balanced teacher who trains in love. 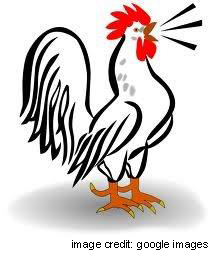 Who is the rooster in your home? If it is one or more of your kids, are you ready to take your coop back? Right now is the best time to work with your kids on developing a consistent quiet time. There are many good resources out there to accomplish this. How can you encourage your kids to have consistent devotions? 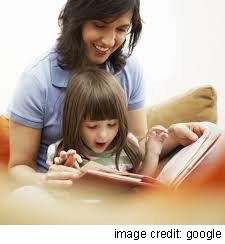 Set reasonable expectations – Most devotion books allow kids to have their quiet time in 10-15 minutes. Be satisfied with this. Write it down – Encourage them to write their prayer requests in a spiral notebook or journal, and to use this same notebook to answer the questions that are asked at the end of the day’s lesson. Sharing keeps kids accountable – One night a week, Dad invites the kids to bring their notebooks and share 2-3 things in their devotions that spoke to their hearts. Have them share 1-2 answers to their prayer requests so kids can see God does answer prayer. Encourage them to write the answers to their prayer requests in the journal. Lead them to Jesus – Your kids will love hearing what God is teaching you as well. During this weekly share time, Mom and Dad need to be prepared to share 2-3 things they learned in their quiet times that week as well.